Whose idea was this anyway. Well not for 17, 17 years ago. It hasn't been a constant theme. But you know there was a rumor in 02 that we were for sale. And day in my year end report I published the five criteria for a transaction and I said they've never been satisfied. I assume they never will so let's forget about it and nothing ever happened until this transaction came along. Now the criteria you set forth are being satisfied. What about the timing. The now factor. Nobody should impute or infer some sense of where you think we are in the credit cycle etc. Not at all. Not at all. This is a this is a forever transaction. And you know whether it was wasn't ideally timed which I don't have a view on. Wouldn't matter. And why Brookfield some people wonder why you aren't tying up with other firm in the same industry that might use a little help and credit could be Carlyle could be a KKR. and at any point recently or in the 17 years since you wrote that note to clients did you seriously entertain other offers. No we never found the thing that satisfied the five criteria. 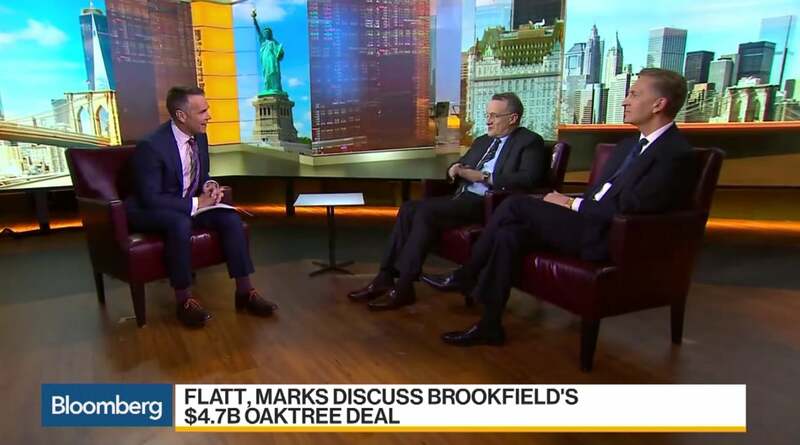 Bruce you told me in December of 2017 it was unlikely that Brookfield would ever buy another asset manager. What changed? Guess you have to eat your words at Times. But look I would just say it's. Not something we've ever really thought of too often. But at. Our clients. Get bigger. And the offerings need to be our offerings need to be large. The one area that we were lacking to be able to. Offer to them. Is credit. And this. Business is. Large enough. That it can be delivered to our clients and many of the. Many the other things we could've looked out there are even building our cell. We've been building. Ourself. But it just takes a long long time and given the scale. Of our business and the relationships that we have in. It we just needed something larger. Did you were you finding. Cells losing mandates because you weren't able to. Fly that demand for credit. You know I just said more positively. I think. The additive nature. Of this. To our institutional relationships will be highly positive. We're going to be able to deliver a number of these products to them on top of. Private equity strategies private equity real estate infrastructure private [inaudible]. Which are which are very large scale and this will be able to go long. To what degree was this a matter of being able to compete better with blacks. You know look there's there's room for many of us. There. This is a 30 40 50 going to 6. Trillion dollar market. There's an enormous number of. Managers that are out there and we compete with lots. Every day. This is just about us delivering for our.